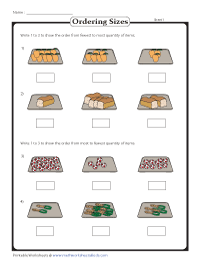 The worksheets in this page strengthen the knowledge in comparing two or more quantities. 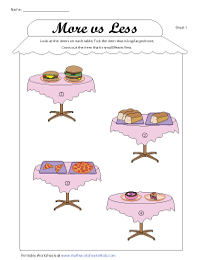 Practice skills contain identifying more or less quantities, choosing items that are fewer or more in number, coloring and drawing activities and more. 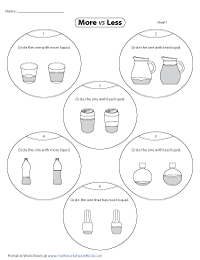 There are some liquid in each container (section A). Color the container (section B) to show more or less liquid than section A. 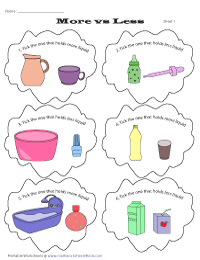 Compare the containers in each question and tick the one that holds more/less liquid. 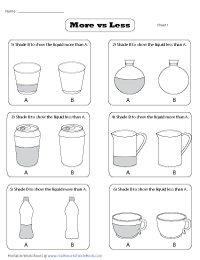 Each worksheet has 6 problems identifying container with more (or less) liquid. 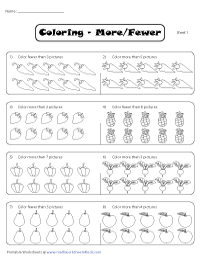 Each worksheet has 8 problems coloring pictures fewer than or more than the number stated in each question. 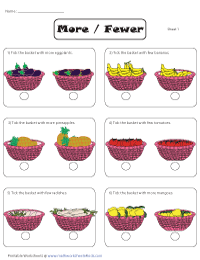 Each question has two baskets with either fruits or vegetables. Follow the direction and circle the basket. Each table has two plates of same food items. Compare the quantity of items, tick the item that is big or large or more in size and cross out the item that is small or fewer or less in size. 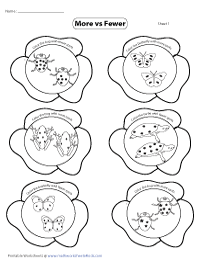 Each worksheet has ladybug, turtle, butterfly and frog with some spots. Color the one that has more or fewer spots. Order the pictures from fewest to most (and vice versa) quantity of items. Fill in the box under each picture to show the correct order.